Hikers, Runners and Mountain Bikers only. A fast draining trail built to IMBA standards. Nicely bermed turns with some drops of varying difficulty. Used for several off-road events including cross-country races and XTERRA events. Camping very nearby plus Iron Mountain Lodge and Marina has cabin rentals less than a mile from most of the trail heads, and the nearby DeGray Lake Resort State Park has a nice lodge and restaurant facility along with lakeside camping opportunities. Lots of switchbacks with occasional rock gardens of intermediate difficulty. When not in the rock gardens, the trail is nice and flowy most of the way. There are nice views of the lake from several locations. This is a growing trail section with two phases done and a phase three starting soon that will take riders close to the lake. There are also plans for a phase four if funding holds out. Trails dry and in great shape! 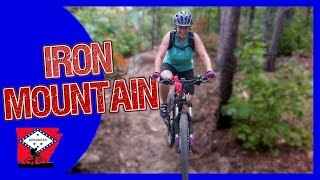 very fast and flowy trail, very few hike-a-bike sections and green trail offers a challenging downhill section. Took dad out for first big mtb ride since heart thing. He did good. We were slow but it was a nice trip. Love this trail. Some of the flowy sections on the Yellow Loop.